FileMaker is known to be a flexible, customizable solution for people in niche markets to build custom apps that suit their specialized needs. For Dennis Hopkins, it allowed him to build a custom app for his wife’s in-home hospice and end-of-life care veterinarian practice, Compassion 4 Paws. Dennis is a true entrepreneur and visionary; he spent many long nights coming up with the technical plans to solve some tough workflow problems his wife faced with finding a software solution customized for the hospice veterinary sector. While he did find a few veterinarian software options available, nothing seemed to fit the procedures for hospice veterinary work as they require a specialized solution. With consulting help from 360Works and other partners in the FileMaker community, Dennis was able to build a solid solution for his wife’s practice. This eventually led to a full blown vertical market solution for veterinary hospice practitioners which Dennis named REX. It had all of the bells and whistles added to make it the perfect solution for veterinary hospice practices. In this case study, we will explore how 360Works plug-ins, add-ons, and consulting helped extend the functionality of the REX solution built with FileMaker. Dennis decided to build a FileMaker solution for Compassion 4 Paws after realizing how much time he and his wife were losing due to paper tracking the process of his wife’s veterinarian work. When the business first started the paper-based processes got the job done, but as the business grew this workflow became unmanageable. Scheduling appointments, invoicing, and tracking DEA (Drug Enforcement Administration) controlled medicine required a robust, customizable data management solution. This is where FileMaker began to solve their problems, and 360Works plug-ins and add-ons for FileMaker added the needed functionality to bring their solution to a higher level of functionality, and meet all of their business needs. In order to get his solution requirements met, Dennis sought out FileMaker expertise from 360Works. He spoke with Joe Pampalon, Senior Developer at 360Works, who immediately presented him with ideas on how to solve both the form manipulation requirements and to get the offline databases syncing. 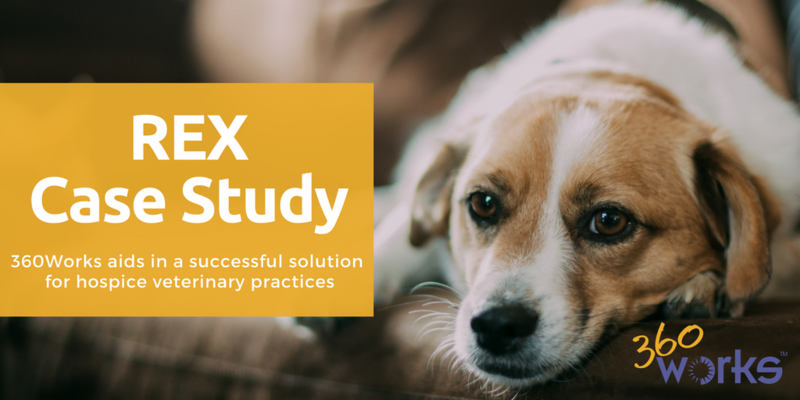 When Dennis was ready to turn his custom app into a vertical market solution, Joe introduced him to 360Deploy to painlessly roll out changes to all veterinary practices and clinics using REX. In each requirement Dennis needed, 360Works had the answer with the needed functionality for his FileMaker solution. 360Works Scribe allowed Dennis to automate the import of Excel spreadsheets containing veterinary practices and clinic locations for euthanasia purposes. This allows the REX application to send a professional courtesy notice of euthanasia via email or fax to all of the veterinary practices involved in a particular patient’s care. All REX needs to know is the name and contact information of those practices, and it seamlessly sends out the notices. Scribe made it much easier to import an existing list, rather than the previous workflow of manually adding 300 - 400 clinics per region into REX. Veterinarians can simply drop their file into a container field in FileMaker and at the click of a button the import brilliantly works in front of them while behind the scenes a very scripted process is doing the work. Scribe makes the import much easier and stable, and reduces the issues you could experience running this sort of import manually in FileMaker. For any small errors that did occur, Joe programmed human-friendly error messages to intuitively guide the user through the corrective process. Dennis recalls, “I used to have to key in all of the different information, now the system is automated and so much quicker.” Thanks to Scribe auto-populating PDF fields in euthanasia forms and invoices, names and contact information are present for an automated, streamlined workflow. REX is able to receive the on and offline mobility it needed thanks to 360Works MirrorSync. The MirrorSync software is fast, scalable, and customizable making it the perfect add-on for medical professionals to work offline in critical, varying situations and sync the changes when they have internet connection. Hospice veterinarians who are out on the field and in homes where there is little to no network connection can update their data and have it sync back with the hosted database on the server. This is especially beneficial for practices with 2 or more veterinarians updating the same file, as MirrorSync has robust conflict resolution designed with the user in mind. When 2 people make a change at the same time, MirrorSync provides several smart options for handling the conflict such as merging the changes together, flagging the edit, user picks, most recent change wins, hub always wins, or email administrator. In order to provide the best solution, Dennis enlisted the help of other partners and developers in the FileMaker Community, including Paradise Partners for their soSIMPLE Calendar and Productive Computing for design help and QuickBooks integration. During this process of several developers updating the same FileMaker solution, there needed to be a streamlined way to make changes to the production file and merge changes with the live file seamlessly. Joe implemented 360Deploy to solve this problem. Now, all developers could make their changes to their development files and update the live production file with the click of a button. Furthermore, if Dennis needs to make his own modifications to layouts or scripts as he can continues to develop REX, he can easily modify it on his dev copy and painlessly rollout the changes to his vertical market solution users.